I live on the north side of downtown St. Petersburg and about three miles north east of where I'm sitting is a little sliver of wilderness called Weedon Island State Preserve. Here it is from the air. 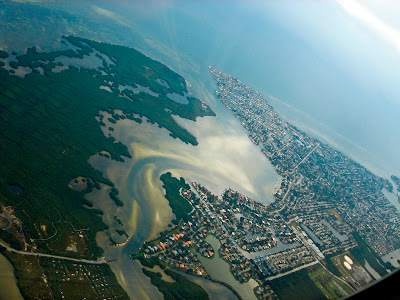 Weedon Island is a pristine slice of old Florida and the preserve itself starts out in the turtle grass beds of the Bay. 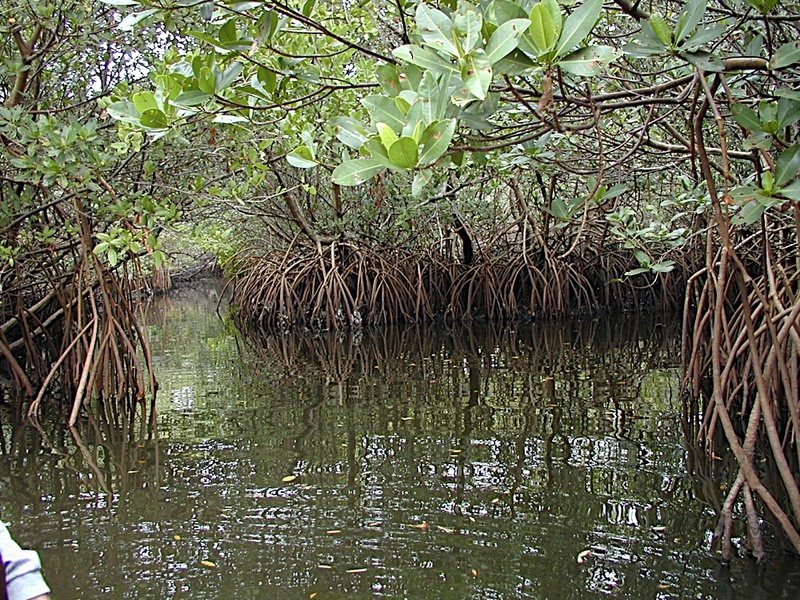 It includes a healthy stand of mangroves and continues inland through pine scrubland, grassy savanna and hardwood hammock. 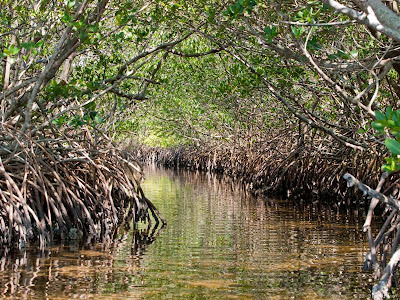 What this means is that you get a good view of an entire coastal ecosystem and the creatures of Weedon Island have enough room to be themselves. Weedon Island has been a beacon to human beings for thousands of years and the evidence of those early habitations keep a team of archeologists working overtime. The earliest inhabitants of Weedon Island lived and fished there from 500 BCE onward. Conquistadors came through Weedon Island when this was an outpost of Spain and it was actually Ponce de Leon who mapped Tampa Bay. Pirates are said to have buried treasure there and in the early part of the 20th century, some dreamer started a movie studio there in the hopes of luring the fledgling film industry away from New York. That industry ended up in some town, I can never remember the name of it, in California instead. Weedon's hardly untouched by human hands but in an area as built up as this is, it's a very welcome respite as well as yet another reminded how tied to the Gulf of Mexico everything around here is. Well as luck would have it, my great pal Melody McFarland and her husband Gene are in town this weekend and we're going on an adventure tomorrow morning. 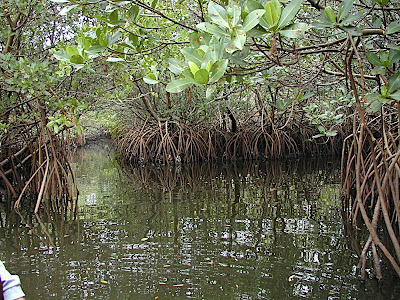 Melody's a biologist who's never kayaked through a mangrove swamp before. I cannot wait to count birds, bugs, fish, snakes and mammals (marine and otherwise) with her. Besides, I need a break so badly I can't stand it. 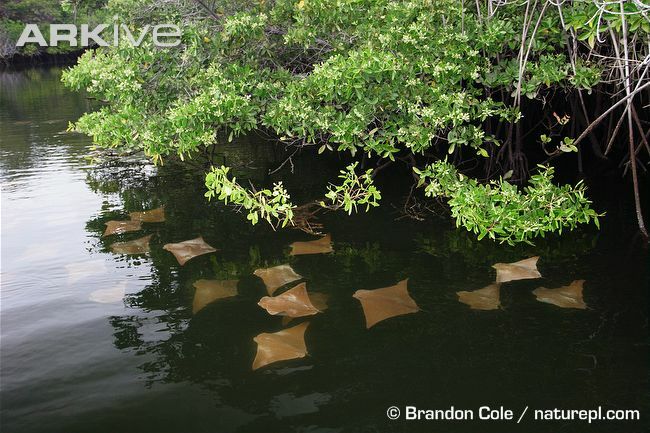 Cownose rays schooling around a mangrove island. 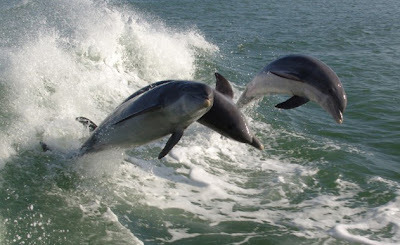 Atlantic bottlenose dolphins in the Bay. Yes, they really do jump out of the water like this. No trip to the Florida wilds would be complete with a sighting or two of Nephila clavipes, the yellow silk spider. Truly my favorite Florida creature and that scale is not a Photoshop trick. 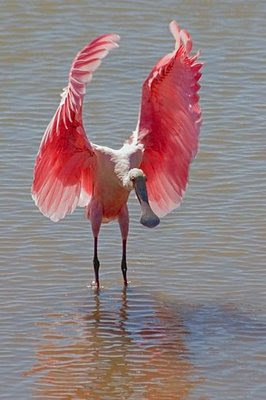 If I had to pick a favorite bird, the roseate spoonbill would come close to the top of my list. Few things in life prepare you for the thrill of seeing a pink bird. 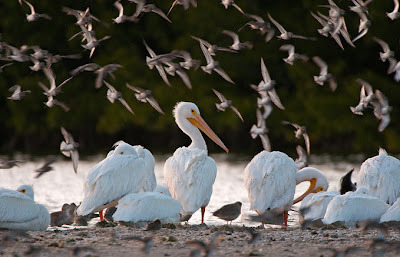 Tampa Bay is one of the few places in North America with a breeding population of white pelicans. If we're lucky we'll see them. 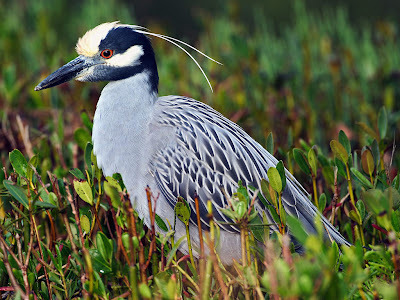 Yellow-crested night herons are pretty common in these parts but they are still captivating. 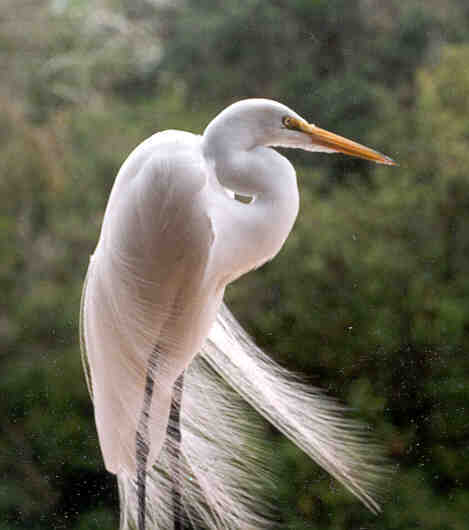 Snowy egrets are pretty common too, but they're in breeding plumage at this time of year and they look otherworldly when they're tricked out in it. And no trip into the Florida wilds is complete without running into a couple of these guys. 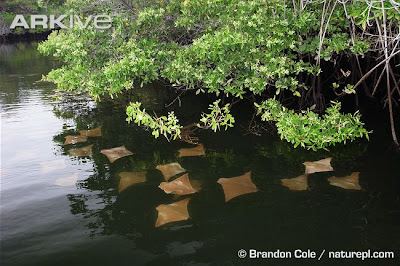 Despite their endangered status, there's quite a population of these guys in Tampa Bay. I love things biological almost as much as I like design-y stuff and I am a fortunate man indeed to have such good friends as Melody and Gene. very cool, paul. i hope you see all your animals- except the spider. ick. do you think this fragile environment will be affected by the oil disaster headed its way? Everything that touches the Gulf of Mexico will be affected. Today is the last day of Stone Crab season and everybody's wondering if this will be the last Stone Crab season ever? A winter without Stone Crabs is as unthinkable as a summer without grouper sandwiches. I'm so envious of your adventure. I did some Googling and your favorite spider and my favorite the "writing spider" (quite common where I grew up in North Carolina) are very closely related. Ooooh, we have Writing Spiders here too. There's a Writing Spider subspecies in The Bahamas that is about twice the size of the ones stateside and they have a metallic coloring to their abdomens that make them look as if they have chrome body parts. Glorious! Oh my! I would love to see those spiders in The Bahamas. In Amarillo I saw a tarantula casually walking across a parking lot one day. They are native to that area. I researched and found that a tarantula bite is no worse than a bee sting and that the movies are to blame for making them seem dangerous. I'm not quite brave enough to pick one up to find out for myself. I prefer to look at spiders from a comfortable distance. I'd much prefer that they keep to themselves as well, despite my fascination with all things arachnid.